Q: According to reports, the DPRK supreme leader Kim Jong-un said in his new year address on January 1 that the upcoming Pyeongchang Winter Olympics is a good opportunity to showcase national image. The DPRK sincerely hopes for the success of the Winter Olympics and the officials from the DPRK and the Republic of Korea (ROK) could meet as soon as possible so as to discuss the possible participation of the DPRK in this event. The ROK President Moon Jae-in on January 2 spoke positively of and welcomed the DPRK's proposal to take the Pyeongchang Winter Olympics as an opportunity to enhance inter-Korean relations and promote peace of the Korean Peninsula and hoped that the Pyeongchang Winter Olympics will be the Olympics of peace that will contribute to inter-Korean peace and the peaceful settlement of the Korean Peninsula nuclear issue. What's your comment on this? A: We have noted the positive message about the improvement of inter-Korean relations and the DPRK's participation in the Pyeongchang Winter Olympics sent by the leaders of the DPRK and the ROK, and this is a good thing. 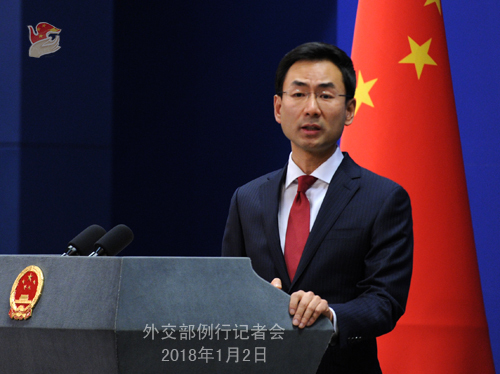 China welcomes and supports the DPRK and the ROK in taking this opportunity to make concrete effort to improve their relations, ease tensions in the Peninsula and realize the denuclearization of the Peninsula. Q: In his new year address on January 1, the DPRK supreme leader Kim Jong-un said that the entire United States was within the range of the DPRK's nuclear weapons and the push button is on the desk in his office. What is China's comment on this? A: The Chinese side has been steadfastly advancing the goal of the denuclearization of the Korean Peninsula and committed to upholding the peace and stability of the Peninsula as well as peacefully resolving the Korean Peninsula nuclear issue through dialogue and consultation. We stressed time and again that the Korean Peninsula nuclear issue is a security issue in essence, and its crux is the contradiction between the DPRK and the US. We encourage the two sides, as major parties concerned, to resume dialogue and build mutual trust and make concrete effort to bring the issue back to the right track of settlement through dialogue and consultation at the end. Q: Yesterday, President Xi Jinping and South African President Jacob Zuma exchanged congratulatory message to celebrate the 20th anniversary of the establishment of diplomatic ties between China and South Africa. We noted that President Xi declared that China is going to hold a summit of the Forum on China-Africa Cooperation (FOCAC) in 2018. Can you give us more details? A: China and South Africa are the current co-chairs of the Forum on China-South Africa Cooperation (FOCAC). The FOCAC Johannesburg Summit co-chaired by President Xi Jinping and President Zuma in 2015 was a full success. 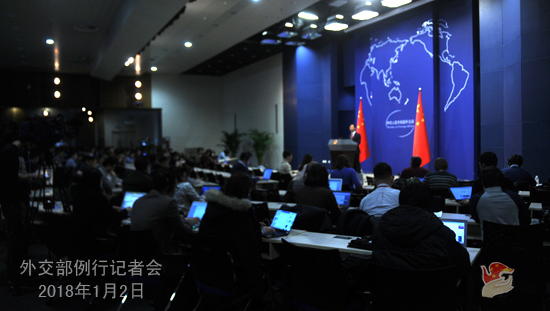 In 2018, a new FOCAC meeting will be held in China. South Africa and many other African countries all hope to elevate the 2018 FOCAC meeting into a summit. In response to the strong aspirations of the African members of the FOCAC and bearing in mind the practical needs of the development of China-Africa relations, China has decided to hold a FOCAC summit in 2018. After 17 years of development, FOCAC has become an important platform for collective dialogue and effective mechanism for practical cooperation between China and Africa as well as a banner that spearheads international cooperation with Africa. The Johannesburg Summit opened up a new stage of China-Africa win-win cooperation and common development. At present, the outcomes of the Johannesburg Summit have been effectively implemented in an all round way, which is injecting strong impetus into the development of China-Africa relations. Against the backdrop of profound and complex changes in the international landscape, the Chinese and African leaders will meet again in Beijing to discuss the policy of China-Africa friendly cooperation, plan for the blueprint of China-Africa cooperation in a new era, roll out major measures to lead China-Africa cooperation and development and advance the China-Africa exchange and cooperation in various areas. This is conducive to deepening China-Africa comprehensive strategic partnership for our win-win cooperation and common development at a higher level and will also help to promote south-south cooperation and the development of global partnerships, and inject positive energy into world peace, stability and development. Following the principle of wide consultation, joint contribution and shared benefits, China will work with African members of FOCAC to prepare for this summit. We believe that with the concerted effort of China and Africa, the FOCAC summit this year will surely be a historic occasion to strengthen China-Africa solidarity and cooperation. Q: Recently a second ship was seized in the ROK over suspected violations of sanctions on trade with the DPRK. According to our information, the ship's registered owner is in Hong Kong, just like the first ship seized. Can you confirm that? Does China have a comment? A: According to what I know, the ship is Panama-flagged, which is different from the information you mentioned. China's attitude is very clear, and we have always stood for the comprehensive and strict implementation of all the DPRK-related resolutions adopted by the Security Council. Q: According to relevant information from the US government sources, China tested a new type of ballistic missile that carried a hypersonic glide vehicle. Can you confirm that and share any information about this? A: I'm not aware of the information you mentioned and I would like to refer you to the military. Q: US President Donald Trump said on Monday that the US has been foolishly giving Pakistan more than US$33 billion in aid for counterterrorism over the past 15 years, and he vowed that this kind of treatment would end. Do you have a comment on this? China has heavily invested in Pakistan, so does China view US aid there as positive for stability and therefore Chinese interests? A: As we said multiple times before, Pakistan has made great efforts and sacrifices for combating terrorism and made prominent contributions to the cause of international counterterrorism, and the international community should fully recognize this. We welcome Pakistan and other countries' cooperation on counter-terrorism and in other fields on the basis of mutual respect and their joint commitment to the security and stability of the region and the world. China and Pakistan have maintained the all-weather strategic cooperative partnership. China stands ready to further deepen cooperation with Pakistan in various fields to bring greater benefits to the two peoples. Q: According to the results of the second round of presidential election as announced by Liberia's National Election Commission, Mr. George Weah was elected as the new president of Liberia. What's China's comment on this? A: China congratulates Mr. George Weah on his election as Liberian president. China stands ready to work with Liberia to advance indepth development of the comprehensive cooperative partnership and bring more benefits to the two peoples. Q: First, US President Donald Trump said on Monday that it was time for change in Iran and that the Iranian people were hungry for freedom and human rights. Do you have any comment on that? Second, China just announced that French President Macron will pay a state visit to China next week. What is the focus of his visit? What are China's expectations? A: On your first question, we have noted reports on the situation in Iran recently. 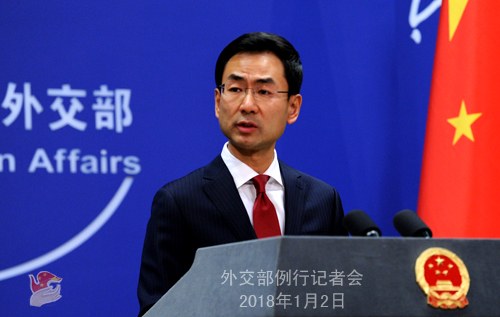 China hopes that Iran can maintain stability and achieve development. With regard to your second question, China has released the information on French President Emmanuel Macron's visit to China this morning. At the invitation of President Xi Jinping, President Emmanuel Macron of the Republic of France will pay a state visit to China from January 8 to 10. This is also President Macron's first state visit to China since he was sworn in. We hope this visit will improve political mutual trust and strategic communication between the two countries and advance the indepth development of our bilateral relations and across-the-board cooperation. Q: China recently held a trilateral meeting to bring about peace between Pakistan and Afghanistan. How do you see this particular cooperation getting affected by President Trump's allegations against Pakistan for not cooperating to rein in Taliban terrorists in Afghanistan? A: Last week, the China-Afghanistan-Pakistan Foreign Ministers' Dialogue was held in Beijing. Foreign Minister Wang Yi, Afghan Foreign Minister Salahuddin Rabbani and Pakistani Foreign Minister Khawaja Muhammad Asif jointly met the press and took questions after the Dialogue. My colleagues have also briefed you on and taken questions about the Dialogue at this podium. As neighbors, China, Afghanistan and Pakistan are linked by rivers and mountains, share common interests and have cultural and people-to-people bonds. It is only natural and necessary for the three countries to cooperate with each other. We have reached 8 pointed consensus in this Dialogue, including agreeing on further deepening coordination and cooperation on counterterrorism and indiscriminately combating all terrorist organizations and terrorists. We believe the three sides will follow through on the consensus reached by the foreign ministers and continue to advance counterterrorism cooperation. Q: We have noted that on new year's eve, President Xi Jinping and Russian President Vladimir Putin exchanged the new year greetings with each other. The two heads of state announced that the two countries will hold the event of the year of China-Russia local cooperation and exchange in 2018 and 2019. Could you share with us more details? A: According to important consensus reached by President Xi Jinping and Russian President Vladimir Putin, China and Russia will hold the event of the year of China-Russia local cooperation and exchange from 2018 to 2019. Local cooperation is an important part of China-Russia Comprehensive Strategic Partnership of Coordination. At present, the local cooperation between the two countries has shown the momentum of positive development and its role in China-Russia practical cooperation has been on the rise. The holding of the year of China-Russia local cooperation and exchange carries on the good tradition of national thematic year event between the two sides in recent years and showcases the high standard and the specialty of China-Russia relations. It will help motivate the locality to engage in cooperation, tap into the potential for cooperation and further enrich the meaning of China-Russia Comprehensive Strategic Partnership of Coordination. China and Russia are now maintaining communication on the preparatory work for the year of China-Russia local cooperation and exchange in an effort to ensure the full success of this major event.